The Trump-flation narrative has driven U.S. stocks to valuations last seen in the tech bubble. On a relative value basis, Europe is a bit more appealing. As a result, hedge funds have been increasing their equity exposure to Europe since early 2017. The Fed is also in the middle of a rate hiking cycle while the ECB remains 40 basis points south of zero. The easy money is overseas. 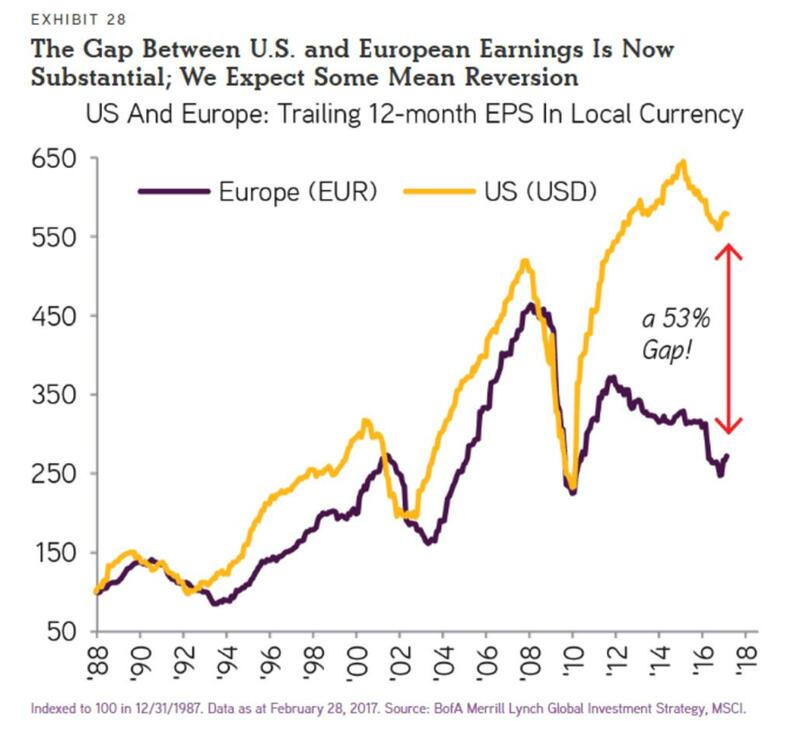 Given those facts, it’s easy to see why money managers are tilting their portfolios away from U.S. equities and towards European ones. But this thesis has one huge hangup. Something so big and nasty that it could completely override typical macro fundamental and quantitative analysis. That something is French elections. And more specifically, that someone is Marine Le Pen. Taxing employers who hire foreigners. Hiring 15,000 more police and building jails to make room for another 40,000 inmates. Immediate expulsion of illegal immigrants and cutting legal immigration to 10,000 people per year. Populism and all of its beggar-thy-neighbor policies are one of the biggest threats to global markets at the moment. That’s why we’ve been tracking the populism trend so closely. Ray Dalio has gone so far as to say that this trend will be even more important than both monetary and fiscal policy in the years ahead. If Europe can get through the French elections Le Pen-free, then the global reflation narrative will pass a significant test, thus strengthening its adoption. Markets were incredibly nervous going into the first round of elections. Traders bid up volatility across the board to protect against a possible “Frexit”. And rightfully so. A Le Pen win would mean absolute destruction to the common currency followed by gut wrenching equity volatility. But these fears ended up being unfounded — at least after the first round. (France has a two round election system.) The base case played out exactly as the polls predicted. 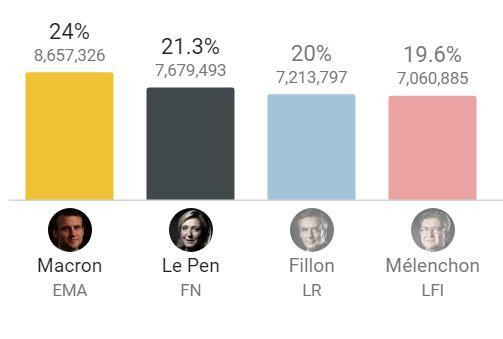 Center globalist Emmanuel Macron took down 24% of the vote. And far right Le Pen came in second place earning 21.3% of the vote. Macron and Le Pen face off in round 2 on May 7th to determine the final winner. 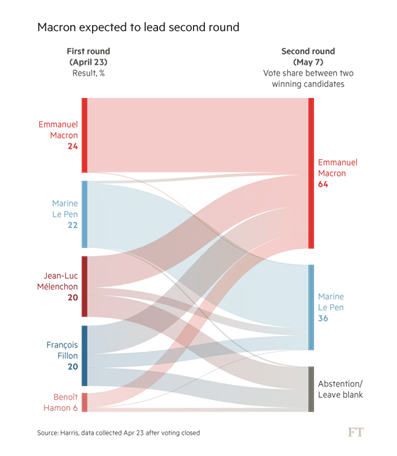 Even though the numbers above look close, Macron is a huge favorite to win the second round. All the support behind Fillon and Melenchon is expected to either move to Macron or abstain altogether from voting in round 2. Le Pen will get no love. Markets have already jumped the gun on this conclusion and have priced in a Macron victory. 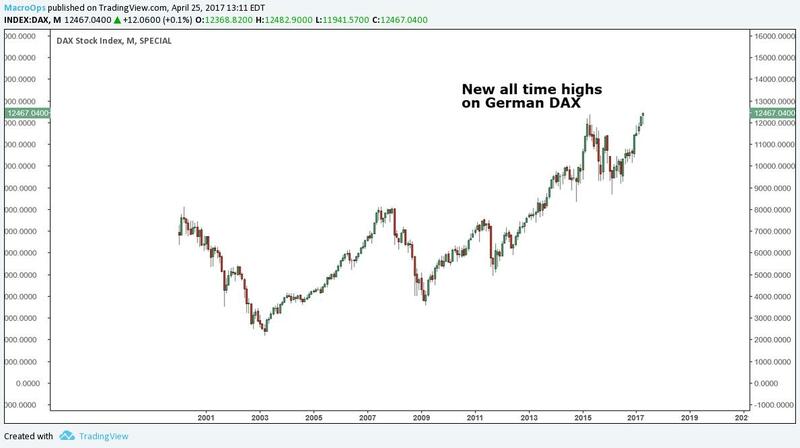 DAX has hit new all-time highs. And VSTOXX (European VIX) has plummeted back to the basement. 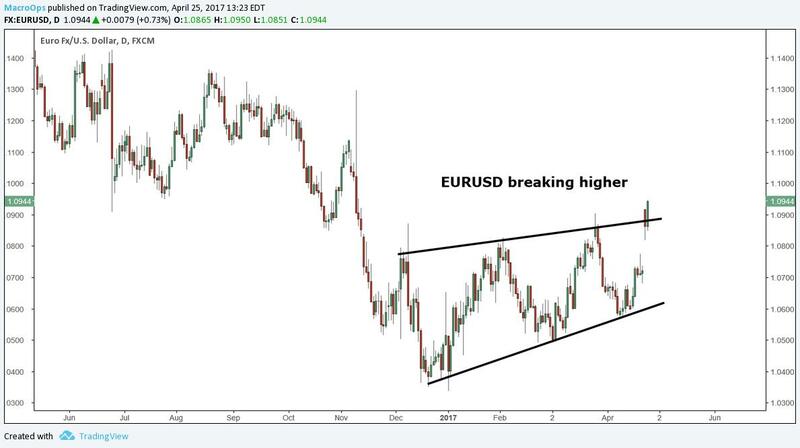 The Euro also rallied against USD and broke out of its short-term range. The initial reaction and results are in line with what we first expressed in early April. Our thesis is that we’ve reached a cyclic top in the trend towards populism. At its core, populism is driven by economic uncertainty. 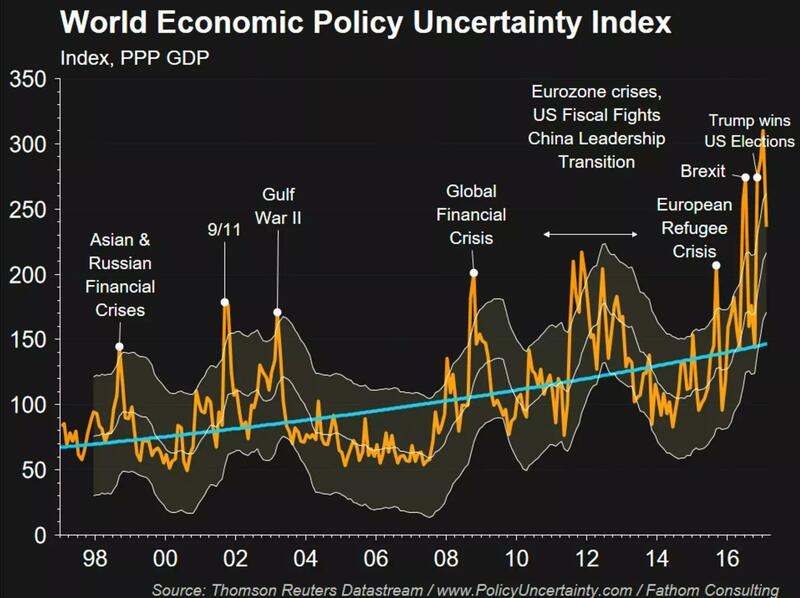 And economic uncertainty has a tendency towards mean-reversion, leading it to cycle around its longer-term trendline. Following the two major upsets in 2016, the secular trend got ahead of itself. We’re due for a reversion back to the long-term trend line. The recent Dutch election results, in favor of the non-populist candidate, strengthened our conviction. We plan to ride the euphoria higher and press our risk-on bets if Macron is confirmed after round 2. Marcon’s win will eliminate investor fear and cause capital to flood into Europe. The recovery narrative will gain steam. Macron is an independent centrist running on a “do what’s best” platform instead of a “my way or the highway” approach like most politicians. He started his own political party, En Marche! (Forward! In English), just for this election. Macron holds no allegiance to mainstream parties. His background is in investment banking, not politics. Macron wants to implement pro-business reforms and jumpstart the economy with a €50 billion package spent over five years. He’s also looking to slash corporate taxes from 33.3% to 25%, the EU average. These are all policy moves that will boister the European reflation narrative, driving their stock market higher. 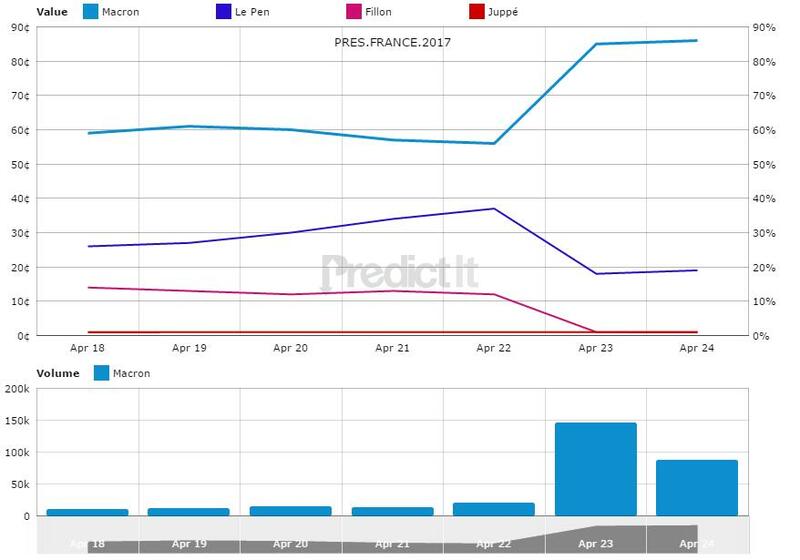 But even though the market is currently acting like Macron will be the next president of France, the Le Pen risk is still not 100% out of the picture. 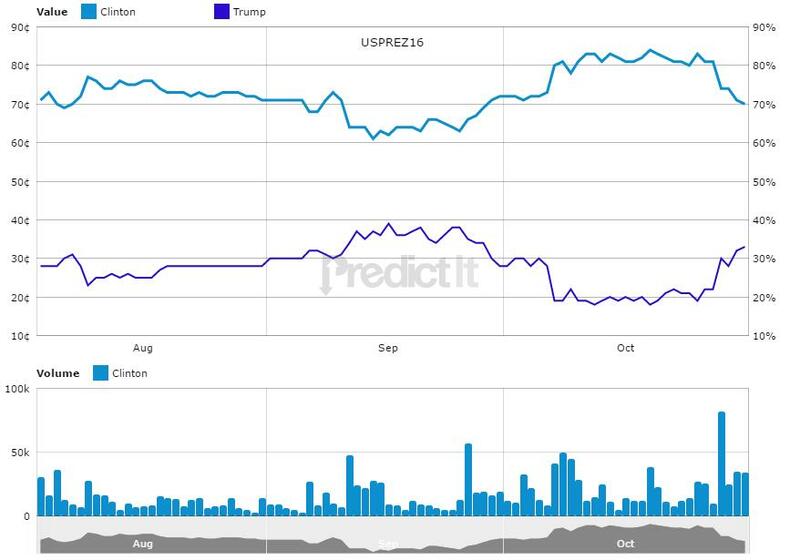 Betting markets give Macron an 85% chance of winning, eaming Le Pen a legitamate 15% chance of upsetting markets big time. We’re sticking with our original call — that populism will subside for the rest of 2017 and Le Pen will lose. But at the end of the day we’re speculators, not pundits. That means we’re constantly updating our views while continuing to manage risk. 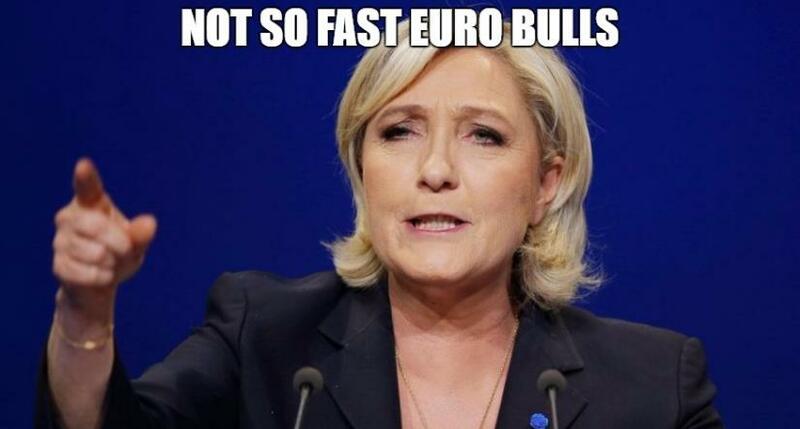 Le Pen hedges look cheap after this week’s market moves. Now that volatility has collapsed, EURUSD puts are back on our radar. In next week’s Macro Intelligence Report (MIR), we’ll dive into the weeds to see if we can find anything attractive to hedge our risk-on stance over the second round binary event. We’ll also be sharing a few new European companies we’ve been researching over the past month that will benefit from the rally. If you’re interested in learning more about the MIR, click here.